This post is part of an initiative to improve the available documentation of GEDCOM X. This particular post describes how death-like information found during a research activity might be represented using GEDCOM X. 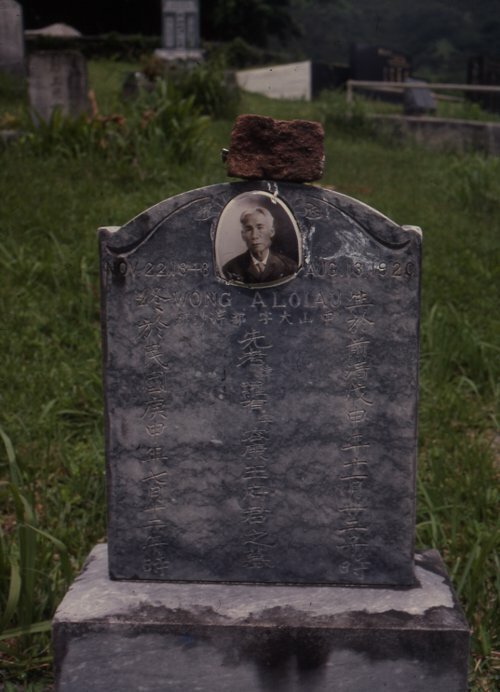 During research for During research for WONG Aloiau (born 1848, Guangdong, China, son of WONG Hin Tai and CHUN Shee, id https://familysearch.org/ark:/61903/4:1:LDKP-MK3), a researcher visits a grave marker in Honolulu, Hawaii, and takes a digital photograph of the grave marker. The marker is described by providing a title, citation, and other metadata. A transcription of the marker (which is in Chinese) is provided, as is a translation. Information about the name, birth, death, and burial is extracted from the marker. The extracted information is assembled together with information extracted from other records to aggregate what is presumed to be known about WONG Aloiau. Source Citation WONG Aloiau gravestone, Lin Yee Chung Cemetery, Honolulu, Oahu, Hawaii; visited May 1975 by Jane Doe. User, possibly aided by software. Source Citation WONG Aloiau gravestone (digital photograph), Lin Yee Chung Cemetery, Honolulu, Oahu, Hawaii; visited May 1975 by Jane Doe. User, possibly aided by software. Source Type Digital Artifact User, possibly aided by software. Source Citation WONG Aloiau gravestone (transcription), Lin Yee Chung Cemetery, Honolulu, Oahu, Hawaii; visited May 1975 by Jane Doe. User, possibly aided by software. ID of Source of the Source S-2 User, possibly aided by software. [Date of birth] Born at former Qing 1848 year 11th month 22nd day 23-1 hour. [Life] ended at Republic of China year 1920 year 7th mo. 12th day 11-13 hour. Deceased father avoid [mention of] Lo Yau also known as Young Hong Wong [noble]residence ruler’s grave. Source Citation WONG Aloiau gravestone, Lin Yee Chung Cemetery, Honolulu, Oahu, Hawaii; visited May 1975 by Jane Doe. Translation by HANYU Pinyin 王大年. User, possibly aided by software. ID of Source of the Source S-3 User, possibly aided by software. The researcher analyzes the grave marker within the context of the other records of WONG Aloiau she has found. She writes an analysis document that details her conclusions of the identity of WONG Aloiau. The gravestone and its digial image are each described by providing an instance of the SourceDescription data type in the root document. The following snippet demonstrates how the sources are described in both XML and JSON. The source descriptions include a title, a citation, and a reference to the cemetery, which is represented using an Agent. Note that the digital image cites the physical grave stone as a source. "value" : "WONG Aloiau gravestone, Lin Yee Chung Cemetery, Honolulu, Oahu, Hawaii; visited May 1975 by Jane Doe." "value" : "Grave Marker of WONG Aloiau, Lin Yee Chung Cemetery, Honolulu, Oahu, Hawaii"
"value" : "WONG Aloiau gravestone (digital photograph), Lin Yee Chung Cemetery, Honolulu, Oahu, Hawaii; visited May 1975 by Jane Doe." "value" : "Lin Yee Chung Cemetery"
The transcription of the digital image is provided as an instance of the Document data type in the root document. The language of the document is described as Chinese, using the “zh” ISO code. The transcription is then described as a source using a SourceDescription. The following snippet demonstrates how the transcription and its description are represented in both XML and JSON. Note that the digital image is cited as a source. "value" : "WONG Aloiau gravestone (transcription), Lin Yee Chung Cemetery, Honolulu, Oahu, Hawaii; visited May 1975 by Jane Doe." "value" : "Transcription of Grave Marker of WONG Aloiau, Lin Yee Chung Cemetery, Honolulu, Oahu, Hawaii"
The translation of the transcription is provided as a Document in the root document. The translation is attributed to another Agent, and is described as a source using a SourceDescription. The following snippet demonstrates how the translation, its attribution, and its description are represented in both XML and JSON. Note that the transcription is cited as a source. "value" : "WONG Aloiau gravestone, Lin Yee Chung Cemetery, Honolulu, Oahu, Hawaii; visited May 1975 by Jane Doe. Translation by HANYU Pinyin 王大年." "value" : "Translation of Grave Marker of WONG Aloiau, Lin Yee Chung Cemetery, Honolulu, Oahu, Hawaii"
"value" : "HANYU Pinyin 王大年"
The following snippet demonstrates how the extracted information is represented in both XML and JSON. Each person is designated as extracted because the information was extracted from a single source. Each person includes a name, an id, and a reference to the translation as a source. The birth, death, and burial information is included on the principal person. "original" : "Pun Sha Village, See Dai Doo, Chung Shan, Guangdong, China"
"original" : "Lin Yee Chung Cemetery, Honolulu, Oahu, Hawaii"
"fullText" : "Young Hong Wong"
Following good research process practices, the researcher writes up a document that describes her analysis of the information about WONG Aloiau that was discovered. Presumably, other sources in addition to the gravestone were located and their analysis would be included in the document. This Java code example, found in gedcomx-java repository demonstrates how to produce the above result. In addition to an analysis document for the researcher’s conclusions about WONG Aloiau, a researcher may also want to provide a document containing an analysis of the grave stone itself. For such purposes, the Source Description data type provides an analysis property that can resolve to an analysis document.